Is your purpose as a publisher to keep your company safe, or to use your position of privilege to further the truth? Editorial by Neal Maillet, Editorial Director, Berrett-Koehler Publishers. 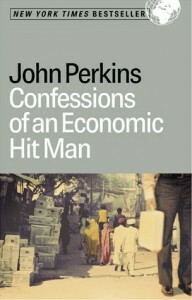 One of Berrett-Koehler’s bestselling books is Confessions of an Economic Hitman by John Perkins, which just happens to be a whistleblowing book. With well over a million copies sold, most people recognize the title whether or not they’re familiar with our company. The first whistleblower book I edited was The Corporate Whistleblower Survival Guide, which we co-published with the Government Accountability Project (GAP), an amazing organization with the website whistleblower.org. 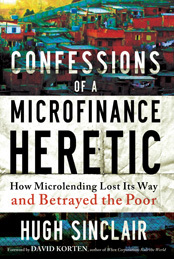 The whistleblowing book into which I’ve invested the most time is our new book Confessions of a Microfinance Heretic by Hugh Sinclair. I can well remember the procession of emotions and reactions leading up to publishing Hugh’s book, which we already know will upset people, attack cherished assumptions, and challenge beliefs. I’ll be honest when I say that I was not extremely excited or optimistic about publishing Hugh Sinclair’s book when I first learned about it — but I felt we had to give him a hearing after I read the proposal. Unlike most memoir proposals that come scrubbed clean of rough edges by literary agents, Hugh’s had come to us unpolished and in strictest confidence because we published Hitman. His letter and sample was powerful. Hugh has worked in microfinance at the street level for a decade, and he knew more than almost anyone about how the business worked behind the scenes. Like John Perkins, Hugh was a finance guy who had unraveled a broken financial model, and he knew he’d risk becoming a pariah in his industry once he told his story. Hugh was saying some very disturbing things — things that I struggled to accept. Billions of dollars in microfinance were generating obscene returns for banks and financial institutions, but generating mostly harm for the poor. Interest rates (up to 150%) were leading to suicides, illegal and abusive schemes were woven into the very microfinance model, and cherished names like Kiva and Grameen were part of the problem. Most microfinance loans were going to consumption, not venture creation, and no evidence existed — apart from PR campaigns and anecdotes — that microfinance actually reduced poverty. The sector has all the markers of a bubble, yet the bubble is built on the backs of the poor. The more I talked to Hugh, checked his facts and learned about his history, the more the weight of his tale and his conviction erased any doubts. Something was deeply wrong, yet the public image of microfinance was so far from the reality Hugh described. Most people assume publishers are happy with any publicity their books receive, but we’ve published Hugh’s book in the full expectation that we’ll receive more attacks than plaudits. The same could have been said when we published the Perkins book, which had been rejected by twenty publishers before we took a chance on it. Whether or not events prove you wrong in the end, you have to assume that you’ll be punished for saying something that people just don’t want to hear. I think this also explains why we don’t publish whistleblowing books every season — you’d think the opposite would be true given our sales success with them. The bar for publishing such a book has to be high — the right kind of book will upend models, invite attack, and cause a mess. You’d better be certain the book is telling the truth, and that the truth will help fix a broken system. Bitter, vengeful, or negative books just won’t cut it. On another level, however, I can’t think of a better test for one’s publishing backbone. We publish plenty of books we know will sell well from the first read. You could have a great career and make money just taking the safe bets. However, I think publishing books by whistleblowers is the price you must pay for sitting in the publisher’s seat. Is your purpose to keep your job and your company safe, or to use your position of privilege to further the truth, even when that truth is inconvenient for everyone, including you? Whistleblowers face the same dilemma when they decide to speak up. Tom Devine, the author of Corporate Whistleblower’s Survival Guide and legal director at GAP, has worked with 5,000 whistleblowers, and he tells me he has tried to talk every one of them out of blowing the whistle. Even if a whistleblower is one of the lucky few who will achieve a legal settlement or some other form of reward, they will throw their careers, marriages, families, and finances into a shambles. Most win nothing and never recover their livelihoods. Yet thousands do speak up despite the risks — and that makes the risks we take publishing whistleblowing books small by comparison. I’ll be able to come to work on the publication date of any whistleblower book I work on. Most whistleblowing authors won’t have the same privilege. SURVEY: Do Publishers Have an Obligation to Challenge Convention?